Discussions Magazine Music Blog: HOUSE OF LORDS/Cartesian Dreams: The NEW album! HOUSE OF LORDS/Cartesian Dreams: The NEW album! 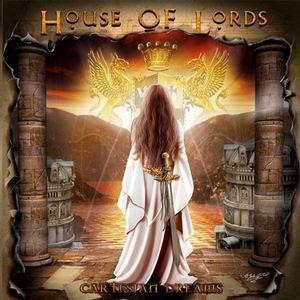 Frontiers Records proudly announces the release of the brand new HOUSE OF LORDS album entitled Cartesian Dreams on September 18th in Europe and October 13th in the USA. Following the 2008’s release of Come to My Kingdom, a record equally hailed by critics and fans as one of the highlights of the season, HOUSE OF LORDS carved another masterpiece that sets in stone the legacy of one of the most productive and impressive bands of the scene. “This new CD was truly a labour of love” says singer James Christian. “I was so fortunate to be able to work once again with my writing partner and friend Mark Baker. The last time Mark and I worked together was to write and record Demons Down. We have a great chemistry when it comes to writing songs. Jimi Bell once again gave us smoking tracks and Tommy Denander also put his contribution on a few great tracks”. The songs written for the new CD offer many different flavours. “The band as usual always strives to stay true to its sound but this time around we expanded our horizons a bit without compromising the trademark sound that so many people expect from us”, continues James “We don't want to keep making the same record over and over, so this time around you will hear a few things you did not hear on the previous CD's”. House of Lords debuted in 1989 with the release of the self-titled album, a record which is still regarded as one of the best Arena Rock releases of the 80’s. The colossal sound, the soaring vocals of James Christian and instrumental capabilities of the band (which featured ex Angel and Giuffria keyboardist Gregg Giuffria, along with such luminaries as Lanny Cordola, Chuck Wright and Ken Mary), reminiscent of such frontrunners as Whitesnake, Deep Purple and Van Halen, immediately brought the band to the attention of the media and fans. With their sophomore release entitled Sahara, House of Lords gained considerable chart success with their cover version of Blind Faith’s “Can't Find My Way Home”. After a tour with Nelson in 1991, the group disbanded, eventually coming back with a new lineup (only featuring original members Giuffria and Christian) in 1992 with Demon's Down. With the change of the musical climate, House of Lords went into hibernation, until the original lineup came back together in 2000, releasing of the controversial Power and the Myth, an album which featured a sound leaning more towards Progressive Hard Rock with 70’s rock influences. After a short European tour, singer James Christian decided to go back to the trademark Arena Rock sound of House Of Lords, putting together a new line-up with the blessing of founding member Gregg Giuffria, who opted out right before the release of Power and the Myth. New members Jimi Bell on guitars, B.J. Zampa on drums and Chris McCarvill on bass supplied a true powerhouse sound to the fifth studio album World Upside Down, a record which caused a real stir in the Hard Rock and Melodic Rock scene and was followed up by the equally impressive Come to My Kingdom. The new album Cartesian Dreams is a natural progression for a band that has such a long history and is just what you would expect and even more: superb hooks, majestic atmospheres that bring back the memories of the debut album, monumental guitar riffs and a production to die for. “The one common thread with the band is that we are always on the same page in terms of what want our records to sound like” concludes James. House Of Lords continues to grow with every record and everything in Cartesian Dreams shines from the first second to the last!